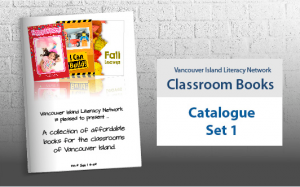 The Vancouver Island Literacy Network is please to offer a collection of locally created books for K to 3 classrooms. These books were made by teachers across Vancouver Island. Several amature photographers gifted us their images, while others were obtained from creative commons sites. Intentionally, we did not level these books. Rather, we ask that you look at the sample pages in the following links to best determine text levels that will best suit your learners. These books are brought to you from a non-profit stance. Our goal was to get affordable home reading materials into as many Vancouver Island classrooms as possible. We hope you are pleasantly pleased by the price point of these books.